Ljubljana In Your Pocket recently had the pleasure of sitting down with US Ambassador Joseph Mussomeli (or Joe as he is more widely known) to discuss his distinguished career, his time in Ljubljana and his plans for the future, as well as his favourite things to see and do in Slovenia. With a well-deserved reputation for speaking his mind on a wide range of subjects - a rarity to say the least the world of contemporary politics and diplomacy - we found his answers to be an honest and refreshing departure from the usual clichés. How and when did you first decide to enter the foreign services? But as I travelled around Europe I realised they were just as screwed up as America, but just in different ways. Then my father wrote and asked me to return and try to finish university. Feeling guilty, I returned, but I was determined to return only if I could do something with my life that was (1) fun and (2) useful. That turned out to be diplomacy. Selfishly, I reasoned, why hitchhike and sleep along the side of a road, when the government will pay me to travel? And altruistically, I reasoned, the world is so small now and everything is going badly; I should try to help in some small way to make the world better. Where were you stationed before Slovenia? What are the biggest differences between Slovenia and your previous assignments? I started in Cairo in 1981 when Sadat was assassinated, then to the Philippines when Marcos was overthrown, then I worked on North Korea in the Department of State, then to Sri Lanka, Morocco, Bahrain and back to the Philippines. Finally to Cambodia and Afghanistan. Huge differences with Slovenia, at least on the surface. All these countries, with the possible exception of Bahrain, were very poor and undeveloped. Very few trappings of democracy or the rule of law. Very high levels of corruption and cronyism. And, of course, in all those other countries no one ever complained about me going around with bare feet… ;-) So Slovenia is a far safer, cleaner, more open society. But underneath the surface, of course, some of the same problems: corruption, a disrespect for the rule of law by those with power and connections, a self-censoring press, deep-seated animosities within the population and lots of historical baggage. Why Slovenia? Did you choose? Had you ever been here before? Lots of reasons to choose Slovenia. First, I had been lying to my wife for 30 years - I am a diplomat after all! I had kept promising her we would go to a developed country and one with real seasons “soon.” She really doesn’t like the tropics and the desert, so I figured now was the time to finally keep that promise! And second, because our good friend Johnny Young had been telling us for a decade how wonderful Slovenia and Slovenians are. (He failed to tell me about all the problems!) And third, after Afghanistan, being assigned to a quiet, peaceful place seemed very appealing. Yes, but only for a very brief time - not even a full day! - in 1973 as I hitchhiked through Yugoslavia. What is the best part of being ambassador? Being able to make a difference. The problem with most ambassadors (and other people in places of authority), I think, is that they like all the trappings of power and status, but they really fear making decisions and taking responsibility for anything. I really could care less for all the trappings of the office, but I love being able to have an impact...and, I hope, a positive impact. And the worst (or least best to be more diplomatic)? In Slovenia, at least, always “being on.” Meaning, there is no place to escape and be anonymous. I have to be very careful - always - not to be rude, not to raise my voice, not to scratch my nose or cross a street against the light - because I am always, always the ambassador of the United States. I don’t mind it too much usually, but my family especially is uncomfortable always feeling on display. A true vacation for us is when we travel to any other country and no one knows us. Someone once told us that Ljubljana is the only city in the world where the US and Russian embassies are located right next to each other. Have you heard this too? And do you know if it's actually true? Lots of things, good and bad. On the good side, Sharon and I were really worried about coming to central Europe because we had heard that in some neighbouring countries children were not as welcomed as dogs! And we knew that like other Central Europeans, Slovenes loved their dogs. So it was a pleasant surprise to discover that, unlike some of your neighbours, you do like your dogs, but you also adore your children and that you are all unfailingly kind and patient with my little boy. It was also surprising how safe the country is. We had heard it was safe, of course, but it is so safe, so clean, so lovely. We are still amazed - and grateful. Also, we have found the people to be delightfully warm and friendly. At first we thought otherwise because Slovenes are so shy and often they will not even return a greeting if you say “good morning” to them. On the bad side: we had not at all been warned about the underlying historical tensions within Slovene society, nor had we much idea about how little Slovenia had done to modernise its economy and get rid of the old, debunked socialist economic model. And, of course, because the average Slovene is so remarkably honest and respectful of the law, it was a genuine shock to see that those who have been in control of the country do not always have the same high standards of morality as the rest of the people. 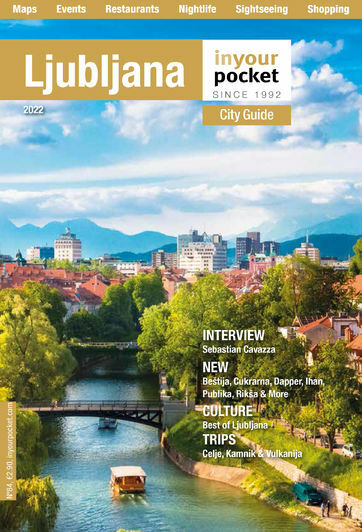 How has Slovenia/Ljubljana changed the most since you first arrived? How have you changed since you first arrived? Aren’t I too old to change? But I have tried hard to be more patient and more understanding and more compassionate. I have a terrible temper and I can be very cruel. I like to think that being among Slovenes has taught me the crucial necessity to be more tolerant and accepting of even those I disagree with the most. It seems that for most Americans (and a large number of Europeans for that matter), Slovenia is still most associated, or even synonymous, with Yugoslavia. Why is this the case, and what can be done to change this? This is completely in the hands of the Slovene people. They had a choice at independence and they chose largely to retain the officials and managers under the old regime, and the economic model of Yugoslavia. Yugo-nostalgia, as we call it, is far more prevalent in Slovenia than any other former republic of Yugoslavia. While leafing through an old book on the ancient Romans, I came across a quote by the 1st century BC Latin poet Horace which succinctly explained this absurd phenomenon and warned against those "laudator temporis acti" - praisers of times past: "If some god offered to take you back to those days you would refuse every time..." How forgetful humans are of the bad things in the past and pleasantly recall only what might seem good now from a far - and safe - distance. We all yearn for the good old days. The sad irony is that even the good old days were never that good. Slovenia has gone through several tourism slogans since independence, including 'The green piece of Europe', 'Europe in miniature', 'The sunny side of the Alps' and the current 'I feel Slovenia'. Do you have a favourite from these? What do you think of Slovenian cuisine? Wine? Honestly, the wines are incredible. I can say, to paraphrase Will Rogers, that “I have never met a Slovene or a Slovene wine that I did not like.” Teran remains my favourite, but they are all so good! I cannot honestly say the same of the cuisine. I love all the hams and sausages, but I still would rather have a good bowl of pasta than anything else. Sorry, I’m such a philistine when it comes to food. Any favourite restaurants in Ljubljana or elsewhere in Slovenia? Well, with a 9-year old at my side, Ljubljanski Dvor is our most frequent eating place! But as I have travelled around the country, I have found a number of amazingly good gostilnas. But if I mention one or two, I fear I will upset or insult that others that I may have forgotten. Of course, the Christmas lighting ceremony and the St. Nicholas parade. But also the Pust ceremony in Ptuj and the St. Martin’s Day events all over the country. Are there any particular Slovenian gifts or souvenirs that you like to bring to friends and family abroad? Virtually all of Slovenia is an hour or less away from Ljubljana by car. What are some of your favourite excursions or day trips outside the capital? Piran remains my favourite city, though Škofia Loka, Kranj, Celje, Ptuj, Maribor, and Velenje are also favourites. I think Bled is lovely, but every visitor we get wants to go there, so I am a little jaded… I love to go to the salt flats, Postojna Caves, the World War I museum in Kobarid, the wineries, especially in the Karst region, and many sites in the mountains. What are the first five words that come to your mind when you hear 'Slovenia' and 'Ljubljana'? Beautiful. Tragic. Wondrous. Safe. Welcoming. You've spoken a lot about the (many) problems facing Slovenia these days. Is there anything specific to the tourism sector where you see room for improvement or growth? Yes. More and better advertisement. More coordination too. For example, we have had friends and officials come here and go to wineries that are closed when they arrive! That should never happen. A few other things, like the service is uneven. Some Slovenes are amazingly helpful and energetic about helping visitors and customers; other Slovenes act like this is still Yugoslavia: they have no work ethic and they sometimes think they are doing you a favour by just doing their job, whether it is being a waiter or a receptionist or whatever. And all these wonderful castles neglected around the country – some of them should be sold and entrepreneurs should use them as hotels and restaurants that actually make a good profit. The US embassy is very active on Facebook and other social media. Why is this important and how has it changed the role of US diplomatic missions in general and in Slovenia in particular? Facebook, social media and public outreach in general is our highest priority. Slovenia is unique within the former Communist states for not having a very high opinion of the United States. With the perhaps understandable exception of Serbia, all the other former Communist states have a better, I would argue, more balanced view of America. While here in Slovenia about half the population has a very positive view of America, but the other half, while not anti-American, is suspicious and sceptical of anything the US does. So it is crucial for us to reach out to Slovenes and have as much contact as possible in as many ways as possible with Slovenes. There are many reasons for this “unique” Slovene perspective on America. Part of the reason is that Yugoslavia in general, but especially Slovenia having had borders with Italy and Austria, was always safe from the threat of the Soviet Union and always had contact with the West, so it has no sense of gratitude that the other countries have. Moreover, Slovenia was wealthier and more educated: both those qualities lend themselves to a certain self-satisfied smugness. In intellectual circles everywhere, including in the US, being cynical and sceptical is often mistaken for actually being intelligent and sophisticated. Most Slovenes we know have not only never been to the US, but also seem to have little interest in doing so. Have you got a similar impression? And if so, why do you think this is the case? I think this used to be more true than it is today. I recall one former ambassador telling me that the Marines used to complain that they could never get a date because Slovene women didn’t even want to consider leaving Slovenia. That certainly is no longer true. Both the economic crisis and the slow evolution of a more open, more curious, more restless younger generation will make travelling to the US more attractive as the years pass. If someone were planning their first ever trip to the US for three weeks of holiday, what would you recommend including on their itinerary? I would recommend they extend their stay an additional three weeks… But if I had only three weeks: the cities of DC, New York, San Francisco, New Orleans, and Cleveland. The last city to see how Slovene-Americans are thriving—while still retaining some of their old animosities from the old country.  And the sites to see: Grand Canyon, Yellowstone Park, Niagara Falls, travel along the Appalachian Trail, visit some battlefields, like Gettysburg, go to all the Smithsonian Museums (they’re free for everyone as national museums should be everywhere in the world; not just free for Slovenes or EU members!!). Wish I had free time. What little I find I try to devote exclusively to my family, especially my 9-year old Thomas. We like to travel, both around Slovenia and outside, especially to Italy. I read, I write, and I play very challenging athletic games like bocce. Have you always been so outspoken? You've spoken elsewhere about the possibility of actually retiring to Slovenia when your current service as ambassador comes to an end. What factors led to this decision, and what generally makes the country such a popular destination for retirees, especially from Western Europe? Slovenia, despite its temporary economic and political crises, is a truly captivating country. As I have already mentioned, it is the safest, cleanest, loveliest country where I have ever lived. The people are not all warm and fuzzy when you first meet them, but they are all genuine and kind, and once you do get to know them they are very warm. Some of the drawbacks are the huge, disorganised bureaucracy - another leftover from the Yugoslav era…or is that “Yugoslav error”…? And the medical system is fraught with problems. The doctors are extraordinarily good sometimes, but the after care and the medical bureaucracy are scary. But all in all, Slovenia offers a healthy, secure and comfortable life. No hassles with traffic, no hassles with crime, no hassles with politics as long as you don’t take things too seriously.